The Yangtze River (Changjiang), over 6,300 kilometers long, is the largest and longest river in China, and the third-longest in the world, next only to the Nile in northeast Africa and the Amazon in South America. The source of the Yangtze River lies to the west of Geladandong Mountain, the principal peak of the Tanggula Mountain chain in the Qinghai-Tibetan Plateau, southwest of China. 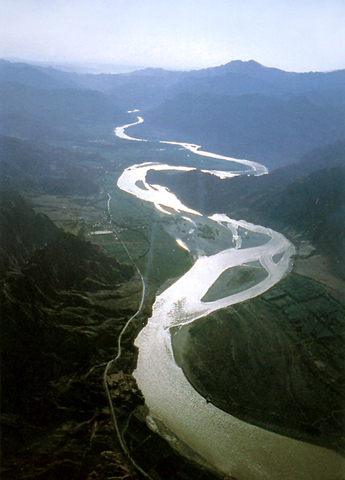 The river flows from west to east through provinces of Qinghai, Tibet, Sichuan, Yunnan, Sichuan, Hubei, Hunan, Jiangxi, Anhui and Jiangsu as well as the city of Shanghai, finally emptying into the East China Sea. 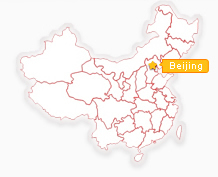 With plenty of rainfall all year round, the Yangtze River is named the golden watercourse. The most impressive section of the river is the three Yangtze River gorges: Qutang Gorge, Wuxia Gorge and Xiling Gorge, collectively known as Sanxia, or the Three Gorges. Qutang Gorge runs eight kilometers from Baidicheng in Fengjie County in the west to Daxizhen in Wushan County, Chongqng City. 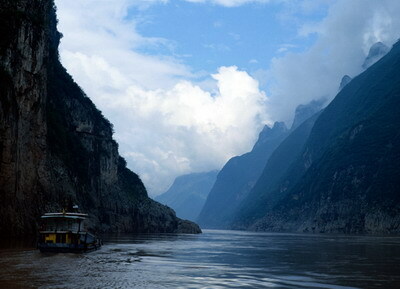 The shortest among the Three Gorges, it is the most spectacular. As soon as the roaring Yangtze River rushes into the gorge, it meets head-on with the imposing Kuimen Gate. Rocky mountains rise perpendicularly like walls on both sides of the river squeezing the broad river into a narrow ribbon threading its way in the gorge. Here the width of the river is reduced to 100-200 meters and the narrowest places are no more than a few dozen meters while the principal peaks on the banks are as high as 1,000-1,500 meters. The turbulent waters flowing in the deep gorge along a continuous line of peaks make a most magnificent picture. 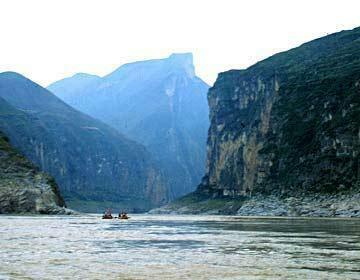 There are many historical sites in Qutang Gorge. 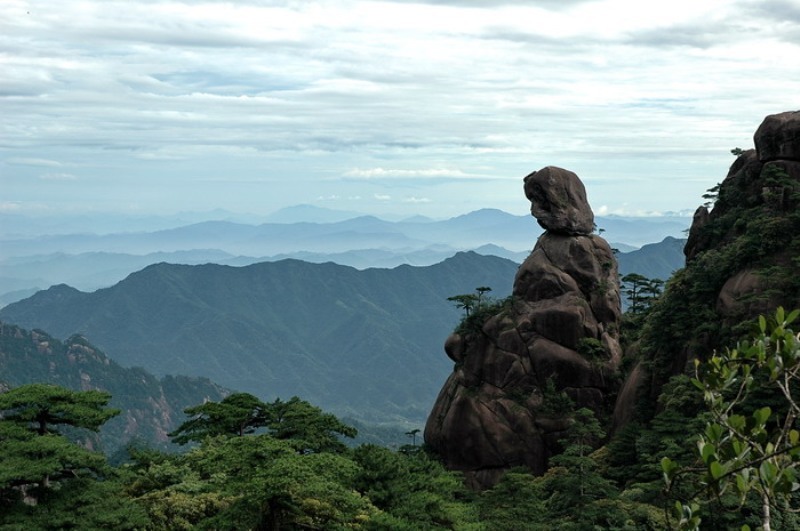 On a hilltop on the north bank are the town of Baidicheng, boasting many rare historical relics. On the south bank are the Whitewashed Wall covered with carved inscriptions, the legendary Meng Liangs Ladder, the Upside Down Monk, Armour Cave and the sweet-tasting Phoenix-Drinking Fountain in a deep cave. Also on the south bank, not far downstream, is a very strange-looking peak standing by the river; it is called the Rhinoceros Watching the Moon because it looks like a rhinoceros. The longest among the Yangtze Gorges, Xiling Gorge stretches west to east for 76 kilometers from the mouth of the Xiangxi River at Zigui in Hubei Province to Nanjing Pass near the city of Yichang in Hubei. It is divided into two sections -- the west section consists of the Military Book and Sword Gorge, the Bulls Liver and Horses Lung Gorge and Kongling Play Gorge, while the east section features the Shadow Play Gorge and the Yellow Cat Gorge, otherwise known as Yichang Gorge. Along this gorge sit many archeological sites, including the Huangling Temple, first built during the Three Kingdoms Period (220-280). In addition, the Three Visitors Cave and the Luyou Fountain all have their unique features.